FORT WORTH — Bulls. Horses. Stetsons. Cowboys. Cowgirls. Rodeo clowns. American and Texas flags. Dirt-stained jeans. Cotton candy. Corn dogs. All the related pageantry and accoutrements of the Fort Worth Stock Show & Rodeo (FWSSR). For second-time visitor Michal Bloom — wife of Fort Worth Rabbi Andrew Bloom — the rodeo was still a relatively new experience Saturday night. But she said it was just as delightful as her first time there — and Will Rogers Coliseum was an excellent place for her husband to promote a message of inclusiveness. Rabbi Andrew Bloom, of Fort Worth’s Congregation Ahavath Sholom, was on hand to deliver the first Jewish prayer EVER at the beginning of the last night of the rodeo. He had been invited to do so as part of a new FWSSR inclusiveness program in which representatives of different faiths offer public, one-minute prayers just before rodeo events. The rabbi’s wife and the two accompanying congregants from Congregation Ahavath Sholom couldn’t have been more thrilled to be there. The 46-year-old rabbi said in a previous interview that he crafted his prayer to be as “diverse, pluralistic and inclusive” as possible. 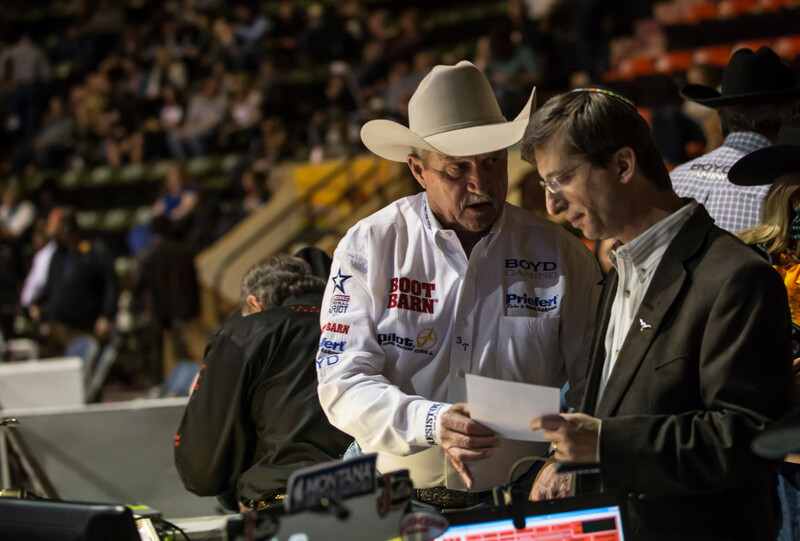 Bloom readied himself for his prayer Saturday night, going through his notes near the central podium where longtime FWSSR rodeo announcer Bob Tallman is positioned during rodeos. Behind him in the stands sat wife Michal Bloom as well as Stephen and Valerie Kaye, who are friends and congregants of Congregation Ahavath Sholom. Many more in the community and from the Ahavath Sholom congregation had wished to attend, but the last night of the rodeo was completely sold out. The stands were so full it seemed there was no elbow room. Stephen Kaye’s family is from Poland. His wife Valerie’s family is from Austria-Hungary — but they have solid ties to the Jewish community of historic Fort Worth. The future Rabbi Bloom and his future wife first met when the two were attending the State Teachers College — Seminar Hakibutzim in Israel. Andrew Bloom is a New Jersey native who grew up in Maryland and served in the Israel Defense Forces. He went on to attend rabbinical school at The Schechter Institute for Judaic Studies in Jerusalem, the Jewish Theological Seminary’s Israel branch. He has been a rabbi for more than a decade — the past four years of which have been spent at Congregation Ahavath Sholom. We ask You, our Creator of the heavens and the earth, to bless these United States, the great State of Texas, and the city of Fort Worth. We ask that you bless our mayor and all of our local, state and national representatives along with our business and communal leaders. May your loving presence shine forth protecting and blessing the soldiers of these United States along with all other first responders who guard our lives and freedoms. It is in this light that we ask that You bring a complete recovery to Sgt. Shane Drake of the Fort Worth Police Department and all other emergency personnel who have been injured in the line of duty. God in heaven, we ask that you bless all the attendees here tonight, us, our families and all good people everywhere. Bless the participants of this rodeo with success and safety, both those who will perform and compete this evening and those who work behind the scenes. We further ask that You bless the animals of this great rodeo so that no harm befalls them. And God in heaven, may You guard our coming and going now and forever more. Amen! What a wonderful article about a terrific person and a real community leader. Rabbi Bloom not only talks about inclusiveness, he actually lives that in his every day life. Fort Worth and the Jewish community here, are very fortunate to have Rabbi Bloom and his family with us.